I'm helping my friend to ask. His school do not give the SPM certificate when he leave the school. Now we are located at overseas (Singapore) and his job require SPM certificate. Does MOE post to overseas address (Singapore)? - If yes, is it application fees still the same RM10 or any extra charges for overseas postage? - Estimate how long he will receive it? In this case, he still need to do a police report? 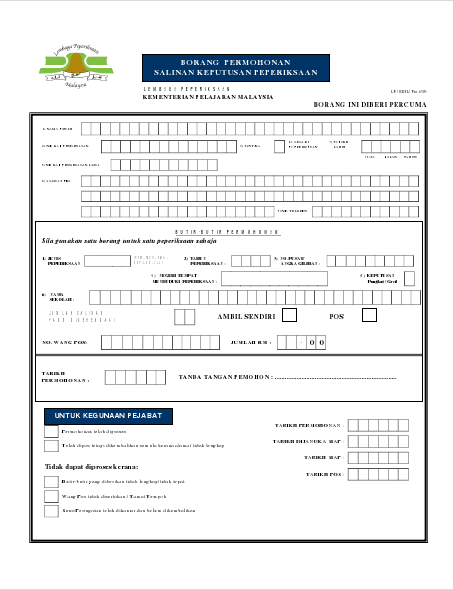 Some website written, if lost the certificate is required to do a police report and the report have to submit with the application replacement form. I would like to seek for your advice. Ans 1: Application fee is RM 10 for 1 SPM Cert. you need to include an A4 size Pos Ekspress envelope (must be A4 size and with your name and address on it) together with your application form. If before year 1994 (like mine), might take 3 weeks to 1 month. If your friend sat the SPM after year 1994 might receive his cert about 2 weeks. Ans 2 : A police report is not required. I've recently applied for replacement of SPM certificate via post. If your firiend want to receive the cert earlier, he can include an A4 size Pos Ekspress envelope (must be A4 size). May i know if i need certificate spm for year 2006 can get on time? kalau xda salinan pmr/spm/stpm mcmna? Wang pos tu kena tulis apa kat bahagian kepada? (SPM) no pusat/angka giliran macam mana nak dapatkan ye ? Assalamualaikum . Sy hilang slip pmr. Ada dua kan..satu slip warna putih tu yg dpt msa result and satu lagi warna kuning iaitu sijil pmr. Sama mcm slip.. tpi sy dh hilangkan slip pmr yg putih tu. 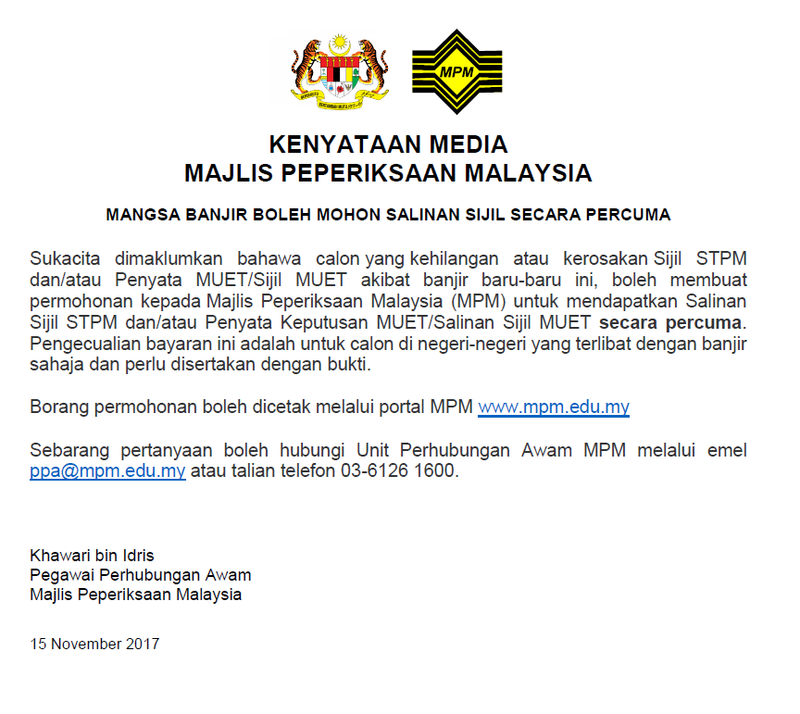 Kna mnta salinan jugak eh sbb sy still ada sijil satu lagi? Wang pos tulis : 'PENGARAH PEPERIKSAAN"
hi, can i know where to get back my ORIGINAL SPM cert? Issit i go lembaga peperiksaan malaysia dy can get bck my original cert within one hour? i need the yellow color A4 size cert instead of the white color temporary cert.. This web is not updated. Currently they charge RM 30 for 1 SPM cert copy. I posted wang pos RM10 to them and was rejected without notice until I called to check after three weeks. I was told that RM 30 for 1 SPM cert copy. However, I did not receive the returned application neither. Hi..thanks for highlighted the issue. It is best to contact them directly for up-to-date info before making any form of payment. may i know how to get the 'angka giliran'? 1992 cert how long can retrieve if I walk in to counter? Also within an hr?? Hi, I been there today and same as you to retrieve my SPM '92. They take 7 working days to process for the SPM cert copy which below '94 and older. The counter rep also very rude and they didn't suite at all to working in that nice and very beautiful environment in putrajaya. Very disappointed. Also with not updated website says charges RM10 which is RM30 but the service more annoying. Increased by 200% charges but the postal period are still the same...2 or 3 weeks. Hi, I lost my SPM slip but I still have my SPM certification. If I apply through post, would they give me a copy of SPM slip or just the SPM certification? Xbagitahu mengenai rm30 pn ..
May I know who had the latest update? Can you help? Very urgent!thanks. where can I get a copy of english translation of SPM certificate? how to get an english translation of SPM certificate? hi...i want to ask..if my spm result all fail..can i get original cert...course in singapore need spm original cert only..how to apply..
2. No need to write "PENGARAH PEPERIKSAAN" in front of your Wang Pos. Just fill in your personal details at the back. 3. Please include an A4 size POS EKSPRESS envelope NOT POSLAJU. 4. Attach a copy of your IC as well with the application form. 5. They will process your application within 7 working days AFTER they receive our application. THE BEST is to call them to get FIRST HAND and UP-TO-DATE information when you are about to apply for the copy of your examination certificate. Hopefully this info is useful for you. Hi, I would like to ask the SPM/PMR certificate we will get back from them..
Is it the yellow original cert or the white copy cert? wang pos harus RM30 dalam 1 salinan sahaja ke? If I need to get it immediately... Will I able to get it if I self present in the jabatan in putra. mine is 2007..
Lebih baik telefon mereka terus untuk dapatkan status terkini permohonan anda mengenai salinan sijik akademik yang hilang. Good day. Right now I very confused. Sila baca perkongisan dari rakan-rakan lain di ruangan komen. Ada banyak info terbaru mengenai topik ini. Hai, nak tanya, bagaimana nak urus memohon salinan spm & pmr kalau sdh 7 tahun saya tak urus sebab kebakaran, polis & bomba report tuu pada tahun 2012 berlaku kebakaran rumah saya & baru saya nak urus sekarang 2018, masih boleh uruskah mohon salinan spm & pmr saya?